Burgeoning Wolverine Star: What a Smith-less defense looks like? What a Smith-less defense looks like? These posts are getting old. Fast. MGoBlog is reporting that Brandon Smith, LB/safety hybrid and apparent heir to the Stevie Brown throne has picked up his transfer papers and is moving on. This is, in a word, ohmygodthedefenseisgoingtobeawfulbad. 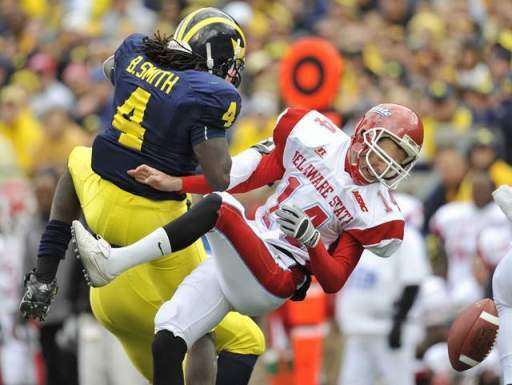 You might remember Smith from such plays as getting kicked in the chest against Delaware State (above), and as the guy who television cameramen continually mistook for Brandon Minor, despite the dreadlocks and name on his jersey. Other than that, not much. That's because Smith couldn't really find a good fit on the defense, only really getting time once the coaches were sufficiently fed up with the play of Mike Williams or random linebacker. So what does this mean for the defense? Again, bad. It had been my assumption that Smith was probably going to take over the Stevie Brown role as hybrid LB/nickel corner/safety because of his athleticism, build, and need to be able to cover players one-on-one. It had been long thought that Jordan Kovacs might take over the role, but as mentioned here before, that last requirement takes him firmly out of contention for the spot. But unfortunately, Michigan has about zero good options for the position anymore. The current depth chart at the Stevie Brown position looks like this: Walk on, true sophomore. So, ya know, dire. As you could tell last year, Brown rarely if ever left the field and was, Graham aside, the most effective player on the defense for most of the year. Losing him without any viable backup is going to be a big hit. The walk on behind Brown last year was Floyd Simmons who sits at an unassuming 5'10", 190 lbs. In other words: No. Behind him is the true sophomore Mike Jones (Who?) who we haven't really seen yet and may end up being a serviceable option here. But again, true sophomore. And that's about it. There aren't too many options here because of the decidedly specific set of skills a player needs to have to play the position. The loss of Smith may necessitate the widely rumored move of incoming super-recruit Marvin Robinson from safety to this position, but standing at 190 lbs. as he's reported now makes this a last case scenario lest we watch him get blasted a la Roh v. Wisconsin every game. I honestly believe that this departure may be more impactful than the likely loss of Donovan Warren if only for purely depth reasons. Michigan is either going to need an out-of-position true freshman or an inexperienced true sophomore to step up into the role that became the most active and diverse role on the defense. This is gonna get ugly. How good is Manny Harris?